India’s new Modi government trains its guns on environmental activists. A contribution to the openGlobalRights debate on Funding for Human Rights. Governments worldwide are suppressing local activism by imposing curbs on foreign funding to civil society. Research shows that civil society is often dependent on this international aid, and that in the most extreme cases, NGOs have been forced by this crackdown to abandon their work. India is no stranger to cracking down on foreign funding to civil society. Now, the new government has trained its guns on environmental activists. 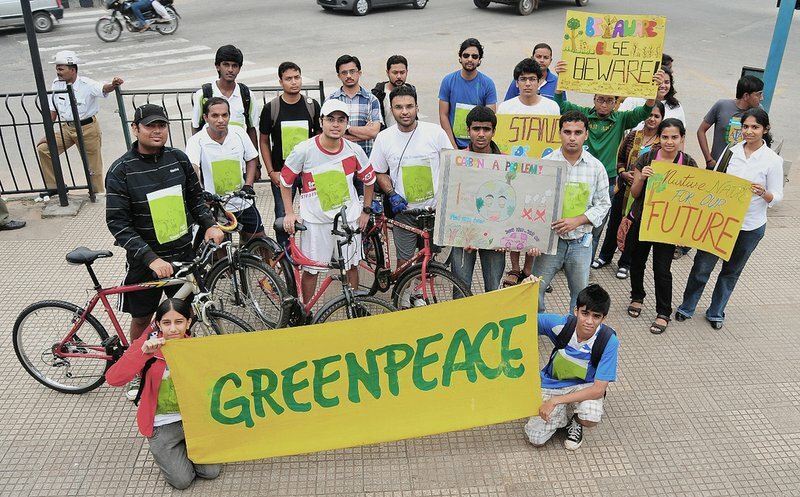 In late January, a Delhi court struck down an Indian government order that, last year, had blocked the flow of overseas funds to Greenpeace-India, saying there was no proof of “anti-national” activities. This judicial respite, however, is unlikely to stop the government from harassing other environmental NGOs, particularly those focused on predatory industry, mining, dam and nuclear projects. Last December, the government clamped down on four environmental NGOs with foreign origins allegedly operating in India: Bank Information Centre, which monitors the World Bank group for the ecological consequences of its lending programmes; the Sierra Club, a mainstream environmental organisation; 350.org, which focuses on climate change; and Avaaz, a campaigning group on human rights and the environment. The latest instance of harassment came on January 11, when Greenpeace-India’s senior campaigner, Priya Pillai, was “offloaded” from a flight to London, where she was scheduled to speak to an all-party group of British legislators on alleged human rights violations at a coal-mining project in Madhya Pradesh, operated by Essar, a London-based company. The government’s move against Pillai was clearly an abuse of power. She had been ordered off the plane by India’s Intelligence Bureau (IB), a non-statutory agency whose authority to do so is questionable. The IB’s action violates the legally stipulated criteria for issuing such orders in “exceptional cases” of convicted criminals, “terrorists, anti-national elements, etc.” seeking to flee India to evade arrest and prosecution. The officer issuing the order, moreover, must provide detailed “reasons”. None of this holds true in Pillai’s case. Last year, moreover, the Intelligence Bureau accused 109 NGOs and individuals in a leaked report, based on flimsy evidence and wild speculation, of “subversive links,” and of abusing the Foreign Contributions (Regulation) Act (FCRA), a law regulating civil society’s use of foreign aid. The agency’s list focused on groups opposing coal-based and nuclear power projects, and genetically modified crops. The report caused a public furore, and the government did not pursue its allegations. The 109 groups and individuals, however, were effectively maligned. The report’s basic premise is that Indian activists who oppose economic projects from conviction and passion have no mind or agency of their own. Instead, they can only have been instigated by “the foreign hand” that does not want India to prosper. Indian environmental NGOs have long suffered from false accusations, arbitrary detention and arrest under several Indian governments. Today, however, the harassment is intensifying under the new Modi government, which took office last May. Yet as others have pointed out on openGlobalRights, India’s own government frequently invites “the foreign hand” into the country. Federal and state authorities zealously pursue foreign direct investment in many sectors, including retail, insurance and military production, all of which were, until recently, closed to overseas investors. In January, Indian finance minister Arun Jaitley led a large delegation to the World Economic Forum in Davos, where he courted multinational corporate capital, in keeping with Modi’s “Make in India” mantra. Environmental concerns are sparking bitter and often bloody conflicts in India. State agencies and private capital are on one side, while disgruntled communities and environmentalists are on the other. Land acquisition for dams, industries, highways, special economic zones, housing, etc. has displaced over 50 million people since Independence, in violation of their dignity and rights, and largely without rehabilitation. Indian environmental NGOs have long suffered from false accusations, arbitrary detention and arrest under several Indian governments. Today, however, the harassment is intensifying under the new Modi government, which took office last May. The Modi team is keen to dismantle India’s environmental regulations, dilute forest protection laws, and ruthlessly fast-track industrial projects without proper scrutiny. It sees these measures as boosting business confidence in official policies and attracting investment to raise GDP growth. It is intensely hostile to grassroots protests, labelling them “anti-development” and “anti-national”, even when they draw on legitimate grievances, and are conducted peacefully. Last September, the prime minister’s office ordered as many as 60 changes in India’s environmental rules. It abolished the need for environmental clearances inside Special Economic Zones, Investment Zones and ports; restricted the powers of statutory expert appraisal committees; allowed mining and other disruptive activities in forests; and undermined environmental impact assessment processes. A high-level committee has also recommended far-reaching changes to five major environmental laws, including abolition of pollution control boards, self-certification of environment-related information by project promoters, automatic clearances for roads and power-lines cutting through forests earlier declared “no-go” areas, and a greatly weakened process for obtaining consent from locals. These amendments will harm livelihoods, cause extensive environmental degradation, and lead to greater pollution. The World Bank conservatively estimates the annual cost of environmental degradation in India at 5.7 percent of GDP, higher than the rate of growth of national income. Coal consumption in India – the world’s third-largest coal producer, consumer, and importer – is on the rise. The four NGOs whose foreign-exchange accounts are frozen are all active in campaigns against coal-based power generation. Bangloreans participate in a cycle rally initiated by 350.org in support of Global Work Part day. The government is targeting green activism through the FCRA law. The FCRA’s origins lie in the paranoid fear of “foreign powers” and the law dramatically restricts overseas aid to local civil society. Getting a permit for foreign funding involves close screening by intelligence agencies, and has never been easy. Only 43,527 out of India’s over two million NGOs have such permits. In 2010, the government drew up new rules barring foreign aid recipients from “political actions” including strikes, road-blocks and other nonviolent, democratic forms of protest. Prior to being elected prime minister, Narendra Modi was chief minister of Gujarat state, notorious for its repression of the Medha Patkar-led Narmada Bachao Andolan, a movement of dam-affected villagers. The prime minister’s Bharatiya Janata Party is known for its ultra-nationalist chauvinism, intolerance, and strong-arm tactics. Modi belongs to an ideological current led by the extreme-right Rashtriya Swayamsevak Sangh, an all-male Hindu-supremacist group with a history of admiring Mussolini and Hitler. For all these reasons, India’s environmental NGOs fear Modi’s government will treat them far worse than any other administration in recent history.